Commodore Antonette S Wemyss-Gorman enlisted in the Jamaica Defence Force in August 1992. She completed her initial Officer training at the Britannia Royal Naval College in the United Kingdom in March 1994 and was posted to the JDF Coast Guard as the first sea-going female officer to serve in the Jamaica Defence Force. She served as Navigating Officer onboard HMJS PAUL BOGLE from 1994 to 1997. In January 1998 she was seconded to the Ministry of Transport and Works for two years where she was appointed Deputy Director of Marine Transport. She was first appointed to Command a 82 ft Point Class Vessel in July 2002 and later commanded a 42m County Class Vessel (HMJS SURREY) 2006 – 2008. Commodore Wemyss-Gorman has held a number of other appointments in the JDF Coast Guard. She is a graduate of the US Naval War College and served as the Second in Command of the JDF Air Wing over the period August 2009 – August 2011. Commodore Wemyss-Gorman holds a Master of Science degree with distinction in National Security and Strategic Studies from the University of the West Indies. 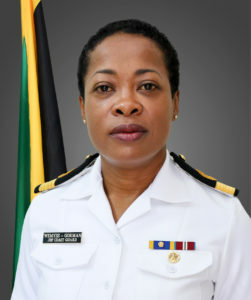 Commodore Wemyss-Gorman presided over the establishment of the Caribbean Military Maritime Training Centre in 2012 and served as the Commandant until November 2013 when she was appointed the Acting Commanding Officer of the JDF Coast Guard. She became the first female in the Jamaica Defence Force to attain the rank of Commander in 2014, Captain (N) in 2018 and then Commodore in 2019. She is a founding member of the Women in Maritime Association of the Caribbean and an active member of the Women’s Leadership Initiative group in Jamaica which is a Sub-committee of the United Way. She has been awarded the medal of honour for meritorious service and the commonwealth Jubilee medal. She has also received an award for distinguished leadership by the United Way Women Leadership Initiative, Jamaica in March 2015. She is Forty three years old, has one son and is married to Jonathan.